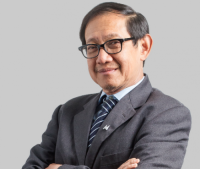 Hermawan Kartajaya is the Co-Founder of Asia Marketing Federation, President of Indonesia Council for Small Business (ICSB), and President of ACSB (Asia Council for Small Business). In 2003, he was named by the United Kingdom’s Chartered Institute of Marketing on the list of "50 Gurus Who Have Shaped the Future of Marketing" that includes the likes of Philip Kotler, David Aaker, Gary Hamel, Tom Peters, and Seth Godin.In 2009, he received the Distinguished Global Leadership Award from the Pan-Pacific Business Association at the University of Nebraska-Lincoln. He also received Lifetime Achievement in Marketing Award from Jawa Pos and a honorary doctorate from ITS Surabaya. He is a unique combination of a thinker of strategic business concepts, particularly in marketing, and a practitioner. He has written eight international books with Philip Kotler—the father of modern marketing. His latest books, Marketing 3.0 is widely acknowledged globally and is translated into 26 languages around the world. And also Marketing 4.0 which is translated into 21 languages. His marketing concepts can also be found in Global Marketing Management and Principles of Global Marketing textbooks by Warren Keegan—the world’s renown expert of global marketing. To help companies in Southeast Asia grow, he founded MarkPlus, Inc.—Southeast Asia’s leading professional services firm in the area of marketing consulting, research, and training—in 1990. Prior to leading his own firm, he was the sales and distribution director of a major consumer goods company. Hermawan Kartajaya is also an internationally acknowledged speaker and lecturer. He attended Harvard Business School’s Program on Case Method and Participant-Centered Learning in Boston and Beijing, exclusively designed for senior professors and deans of universities in Greater China and Singapore.Since 2006, he guest lectured for Nanyang MBA and Nanyang Fellows Programme in Singapore.He has been invited as a speaker by seminars and conferencesaround the world. Recently, he became the first speaker at the World Marketing Summit 2012 in Dhaka, Bangladesh and also became speaker at the World Marketing Summit 2014 and 2015 in Tokyo, Japan. He was also the keynote speaker for the QSP Summit 2012 in Porto, Portugal and a featured speaker for the Kellogg Innovation Network Global Summit 2012 in Evanston, US.  Repositioning Asia: From Bubble to Sustainable Economy; Philip Kotler and Hermawan Kartajaya, John Wiley & Sons, 2000; Translated to Thai, Japanese, and Indonesian.